例句：A nod is a sign of agreement. 例句：Influenced by old ideas, some corporations assign posts according to seniority. 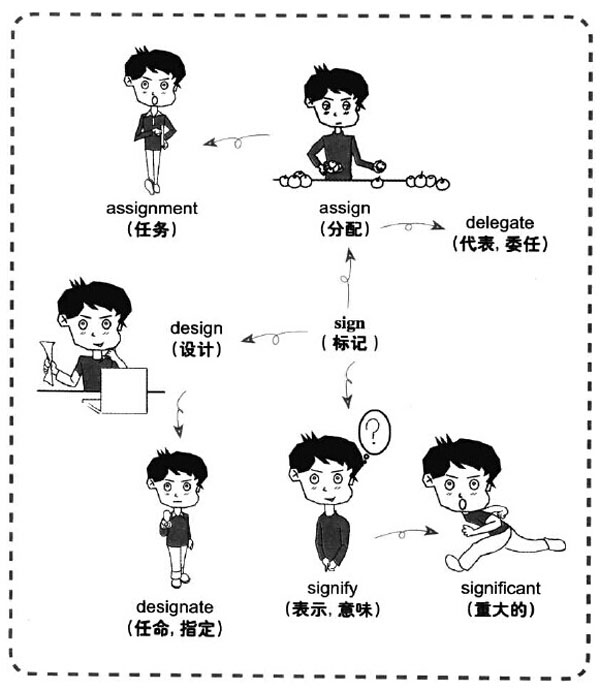 例句：How are you going to get through the assignment? 例句：The new manager was delegated to reorganize the department. 例句：The scarfs were designed for extremely cold climates. 例句：The chairman has designated that boy as his successor. 例句：A headache usually signifies that there is something wrong with the body. 例句：Even in the same or similar cultures, there can be significant misunderstandings in oralcommunication. 例句：This new discovery of oil is of great significance to this country’s.